THE TAC Cup Girls 2018 season came to an end on Saturday, with all 12 teams playing out games at RAMS Arena. The Northern Knights secured a grand final spot with a win against the Bushrangers, joining Geelong in the grand final on Saturday. The Falcons themselves as well as Dandenong got big wins on the day while the Cannons got their first win since round three. 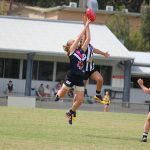 The Northern Knights eradicated all mathematical grand final probabilities with a 30-point win over Murray Bushrangers in the first game of the day. Although the Bushrangers applied good attacking pressure, they were plagued by inaccuracy thanks to a strong breeze at RAMS Arena. The win sees the Knights claim a grand final spot on Saturday against Geelong. Fifteen year-old Ellie McKenzie was the star of the day for Northern. She booted three goals and was a proactive presence in the forward line. Nell Morris-Dalton, Alex Pronesti and Alyssa Bannan were the other goal kickers for the Knights. Northern also had a strong presence in the ruck with Gabby Newton and Neve O’Connor rotating throughout the day. The duo won plenty of hit-outs, allowing Knights midfielders such as Madeline Brancatisano and Abigail Bennett to display good ball-use in the convincing win. The Bushrangers tried desperately to keep themselves in the game with relentless pressure. 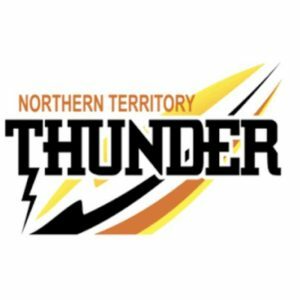 They were stunned when Northern got out to an early 30-point lead at quarter time but fought hard in the remaining quarters. Unfortunately, they just couldn’t convert in front of goal, demonstrated by kicking 0.7 in the last quarter. Olivia Barber was the only goal-scorer for Murray and provided a good presence around the ground. Usual suspects in the midfield, Tamara Smith, Julia Harvey and Rebecca Webster were once again the stars for Murray, with all of them having good stints in the heart of the contest. In difficult conditions the Rebels were off to a quick start, scoring the first two goals of the match. They applied a lot of defensive pressure across the ground and kept that momentum up throughout the game, winning by 25 points over the Chargers. The blustery conditions did not seem to favour either side but the Rebels made the most of it and competed hard to win the footy. On the other hand, Oakleigh struggled to match the intensity applied by the Rebels, only managing to score two majors for the match. Sophie Molan starred for Greater Western Victoria (GWV) with her ability to win the footy at ground level and impact on the contest. She was rewarded for her hard work, slotting a goal in the second term and impressed with her footy smarts to set up her teammates. The likes of Lauren Butler and Sophie Van De Heuvel also played important roles in the Rebels win, applying plenty of forward pressure and opening up space with their clever leads. 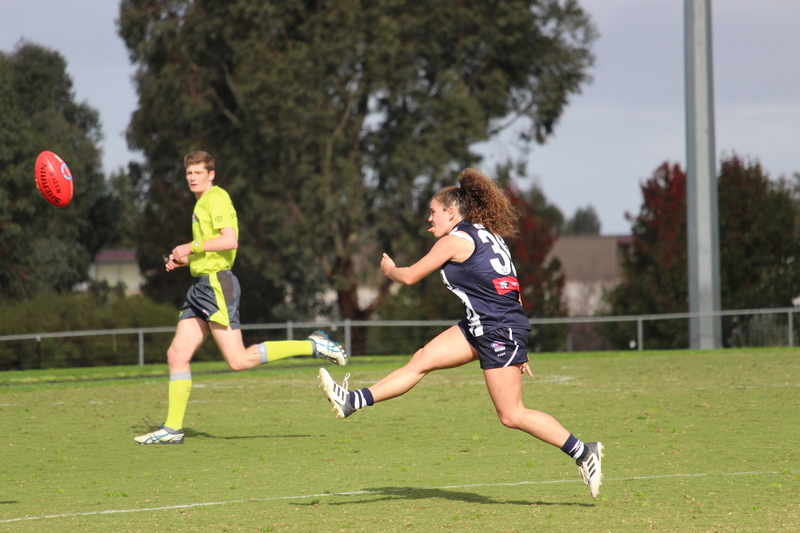 AFLW Academy player Rene Caris starred down back for GWV, controlling the play and imposing herself on the contest. 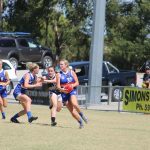 In the last quarter, the likes of Daisy Bateman and Gemma Lagioia really lifted their intensity around the ball and tried hard to create a contest both in the air and at the ground. Alana Porter also provided some good run and carry and was clean at stoppages for the Chargers, helping to propel them forward. Meanwhile Emily Harley kick-started the Chargers’ account, bagging the first major for them in the second quarter. Gippsland and Sandringham came to play in the last game of the season with only three points separating them at three quarter time. Both teams were evenly poised, making for a tight tussle across the ground. The Power dominated the play in the third term but were unable to capitalise on their scoring opportunities. But the tables turned in the fourth with the Dragons coming out firing and bagging four unanswered goals to claim victory by 24 points. The ever-reliable Tyla Hanks starred once again for the Power with her ability to turn opponents inside out and hit targets even while she’s under immense pressure. Hanks’ composure with ball in hand allowed her to set up play for teammates and create forward thrusts for Gippsland. Nikia Webber also played an important role, slotting the first goal of the match and applying plenty of pressure, while Emily Hauesler and Jazz Ferguson continued their hot form, taking big grabs and competing hard for the footy. For the Dragons, the likes of Jemma Owen stood tall, bagging two last quarter goals within minutes of each other, showcasing her ability to read the play and hit the scoreboard. In their last quarter berth, Isabella Eddey stood up, taking charge in the forward line to score her first major of the game and get the Dragons back in front. Teammate, Eleanor Brown also starred for Sandringham with her impressive work rate across the ground and willingness to compete hard and win the footy. A four goals to one first term into the breeze set minor premiers Geelong Falcons up for a comfortable win over Western Jets. Despite the wind heavily favouring the Jets in the opening quarter, it was the Falcons that put the scores on the board, led by Nina Morrison (two goals) who played exclusively forward and was dominant in the air. 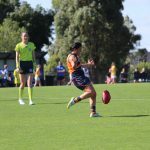 Caitlin Greiser kicked the Jets’ only goal of the game in the first term, but in a positive, Western restricted Geelong to just five more goals for the game, including three when the Falcons had the breeze. Olivia Purcell put in another top performance to be best on ground, her work around the stoppages was a real highlight. Denby Taylor showed she is capable of playing up either end, while Sachi DeGiacomi booted two majors to work well with Morrison (three goals). Renee Tierney also slotted two majors, while Tarryn Love and Lucy McEvoy were others who impressed throughout the contest. For the Jets, it was Elisabeth Georgostathis who was everywhere, producing plenty of strong tackles, including a rundown one on Purcell, and always fighting hard for the losing side. Taylah Kolevski‘s efforts in the ruck against Zoe Inei were superb, while Olivia Forsythe and Sharnie Whiting were others who stood out for Western. In what was probably considered an upset given ladder positions and form, Calder Cannons proved too good for Eastern Ranges, courtesy of a fast start. The Cannons booted three goals in the first term and then held on well against the Ranges in a dour, wet weather affair. 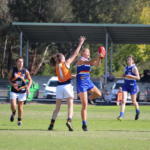 Mikala Cann booted the Ranges’ only goal from a free kick, as Georgia Patrikios put her hat in the ring for one of the goals of the year with a snap from the boundary line in the third term. While neither side could make the Grand Final, Calder got the four points and claimed its second win of the season. Madison Prespakis was best on ground again after a performance everyone has come to expect from the top star. She was everywhere and just dominated at ground level or in the air, booting a great goal in the first term from an intercept mark inside forward 50. Patrikios was also electric up forward, while Carla Rendelmann and Madison’s sister, Georgie Prespakis were also good in the wet. AFLW Academy member, Molly Warburton was named in the best for her work in defence. For Eastern, Cann showed clean hands throughout the contest, while Emerson Woods produced another hard-working effort around the stoppages. Laura McClelland tried to be creative up forward and worked hard throughout the match, while Sarah Kendall put pressure on her opponents around the stoppages and down back. Co-captain, Charlotte Wilson took a few strong intercept marks in defence. The Dandenong Stingrays finished their season with their biggest win of the year, defeating the Bendigo Pioneers by 60 points. The rain did not seem to bother the Stingrays, who managed to kick 10 goals in the slippery conditions. AFLW Academy forward, Courtney Jones was sensational for the Stingrays, kicking three goals and laying some strong tackles. Brooke Borchard also got three majors on the board, working in tandem with Jones to cause some headaches for the Pioneers. Regular contributors, Isabella Shannon and Jordyn Allen also got on the scoreboard. Shannon applied fantastic pressure throughout the afternoon while Allen continued to play her signatory composed style of football to get Dandenong over the line. It was a hard slog for the Pioneers, but there was no shortage of shining lights. Midfielder Kodi Jacques was outstanding for the Pioneers, with her innate ability to clear the ball out of a stoppage. Jacques handled herself with composure during the match and used the ball extremely well. She was complemented as usual by captain, Megan Williamson who has not put a foot wrong all season. Williamson displayed hard running on the day and was a brilliant leader on the field.